How does the understanding of culture in social science differ from the everyday use of the word `culture'? The use of the word 'culture' in everyday life is limited, which refers to the artistic performances such as dance, music, painting, drama etc. But social science understands culture in a scientific and prescribed way that is not only limited to drawing and painting but more than it. Culture has shaped our life and the society as a whole. 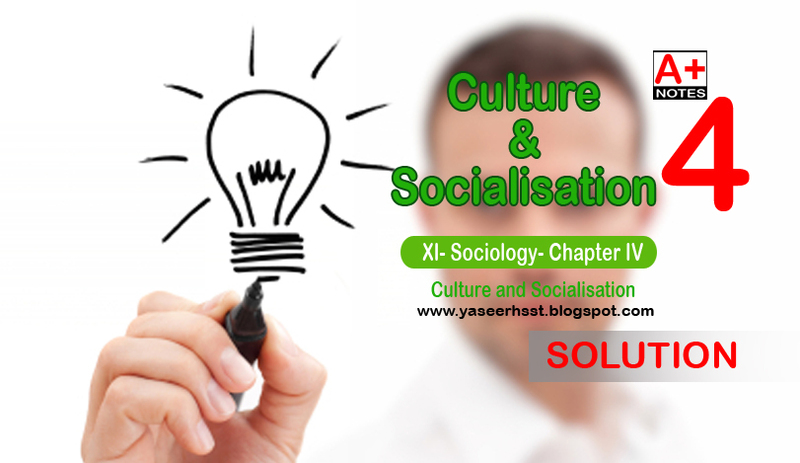 In sociological terms, culture implies the common understanding which is learnt and developed through social interaction and then passed on to the next generation. Therefore, in everyday use, the term culture is used for individuals, whereas in sociology, it is used to denote the entire group or the society. Edward Tylor was the first anthropologist to define culture that includes abstract and intangible dimensions. Later, Bronislaw Malinowski defined culture, which included the use of materials as well. How can we demonstrate that the different dimensions of culture comprise a whole? There are three dimensions of culture cognitive, normative and material that comprise a whole. (i) Cognitive: It refers to how we learn to process what we see and hear so as to give it a meaning. For example, looking at a flag and associating it with the country to which it belongs. Symbolising the waving of hand as a means of saying goodbye. Thus, every culture has given a different meaning to different actions. (ii) Normative: It refers to the rules of conduct. Every society has some rules according to which its members have to behave. As a result, this behaviour and action of the individuals become the culture of that society. (iii) Material: It includes any activity which is made possible by the means of materials. It also includes tools and machines, which is said to be a part of the culture. In the present industrial societies, advanced technology and machines are used. Some societies use them in abundance such as, USA while some do not make much use of it, such as Afghanistan. Thus, use of various materials in different ways for various purposes shows the culture of that society. Therefore, culture can be identified as material and non-material. For the proper and integrated functioning of the culture, both material and non-material dimensions work together as a whole. The use of materials having different notions and ways of understanding different signs and symbols with certain rules of conduct as a whole describes the culture of that society. Compare two cultures with which you are familiar. Is it difficult not to be ethnocentric? Note: Any answer supported with argument or explanation would solve the purpose. The urban culture represents the life in a city, while the rural culture represents the life in a village. In a city, there are industries for people to work with machines, on the other hand, in a village people work in farms to produce crops. The life in villages is simpler and traditional as compared to that of the life in a city. In a city, there is an emphasis on individualism, while in villages more importance is given to groups. Hence, the way of life, culture, occupation and thinking is different in urban and rural areas. Ethnocentrism means giving value to one's own culture and regarding the other culture as inferior. Yes, it is difficult not to be ethnocentric because people mostly give value and superiority to one's own culture. If we compare the villages and cities, it would be obvious that the villagers carry the notion that their culture is better because it is embedded with societal norms, values and traditions. On the other hand, the city dwellers would consider their culture superior because it is modern and liberal. Historically also, the colonialists considered their culture superior and better to that of the colonised countries. The notion of ethnocentrism generates differences and wars between many ethnic and racial groups. For example, the riots of Godhra and Babri Masjid were a result of ethnocentrism. Therefore, it is correct to say that it is difficult for people not to be ethnocentric even in contemporary societies. Discuss two different approaches to studying cultural change. Cultural change is a way in which society changes its patterns of culture. Cultural change takes place through the process of adaptation, contact with other cultures and changes in the natural environment. This change is associated with many sources that can be external factors or can be the internal adjustments of the culture. Evolutionary change is slow, for instance in the case of education. In ancient times, the individuals were often taught orally. Gradually with the discovery of paper, writing and publication of books started. Eventually, new subjects were introduced according to the need of the society. Further, with the introduction of industrialisation, focus on professional courses also increased and with the introduction of information technology and globalisation the new ways of teaching emerged. Finally, several instruments and gadgets like computer and use of internet was invented. Contrary to this, revolutionary change is fast. For instance, revolutionary change takes place through political intervention, as in the case of France. After the French Revolution the estate system of ranking was destroyed and the values of liberty and equality in the society were established. This was a radical change in the society and its culture. Is cosmopolitanism something you associate with modernity? Observe and give examples of ethnocentrism. Cosmopolitanism means valuing other cultures for their difference. A cosmopolitan perception is always ready to adapt other cultures and share its own culture with others. In this process of sharing, neither foreign culture becomes the legitimate part of one's own culture, nor does the indigenous culture lose its base. Hence, it respects every culture. Cosmopolitanism is associated with modernity, in contemporary period, as it is emerging in most parts of the world. Since modernity has to deal with time, cosmopolitanism is phenomenon of the modern world. Ethnocentrism, on the other hand, refers to the standard cultural values that are considered more superior to that of cultural values of others. For example, the British people were ethnocentric as they regarded the Indian culture as primitive and orthodox. Similarly, the people belonging to cities consider the people of villages inferior to them. The above examples show that unlike cosmopolitanism, ethnocentrism ranks the culture as superior or inferior. What in your mind is the most effective agent of socialisation for your generation? How do you think it was different before? In contemporary time, the mass media has emerged as a strong agent of socialisation. Earlier, family and the peer group was the socialising agent in an individual's life. However, now, due to penetration of information technology into the house, people spend more time in front of computers and television sets, than being with their families and friends. Children have started adopting new ways from what they watch on televisions. For instance, they choose their own career and lead a self-chosen lifestyle. They stay connected with their friends through internet and they even depend on the internet for their studies. Hence, their dependence on visual media is much more than that of print media. Not only children, but even women, men and old age people are getting affected by mass media. Magazines, newspapers, radio, advertisements, etc. provide information on various aspects such as health, decoration, eating habits etc. Mass media has therefore spread itself in every sphere of our lives. It gives a shape to our personality and ideas at every stage of life. It had its influence on the society earlier as well but this influence was little. Thus, it is a boon for our society, as mass media has connected the world with one touch. For instance, on internet, information is available with just one click and with a touch one can view everything on television. Mass media has affected the society and also promoted globalisation. It has decreased the distance between different parts of the world. Life before introduction of mass media was very different as people had very little information of the rest of the world. There was no television, radio, newspaper or internet. People in earlier days had to make a lot of effort to gather information and also to spread it.